Welcome! Playing with splashes and water coloring to create a CAS card. I made my splash background with Distress Oxide Inks Cracked Pistachio and Lucky Clover on Water Color paper and added a pot of Cactus. The cactus stamp from Power Poppy Simply Succulents was heat embossed with Zing Chestnut EP on Water Color paper and water colored with DOI Lucky Clover, Salty Ocean. and Vintage Photo. 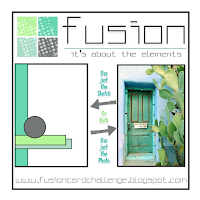 I was inspired by the colors in the Fusion Challenge. Fussy cut the Cactus and adhered to the background placed on Green CS and stamped with a sentiment from the same stamp set with Lucky Clover. 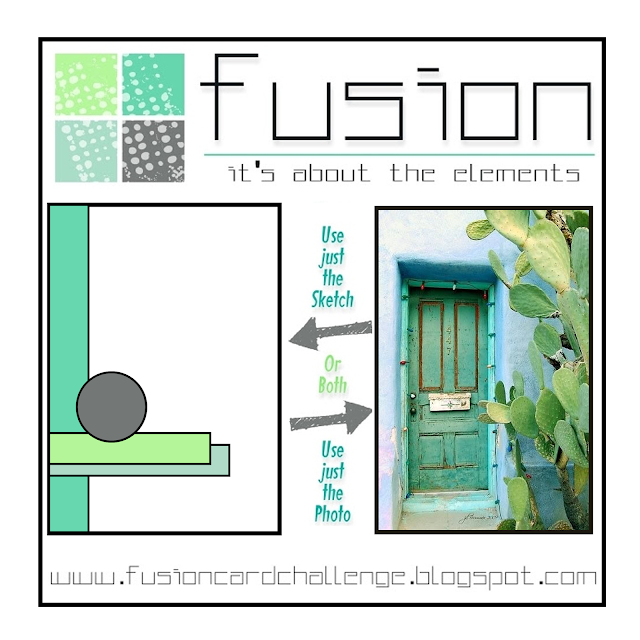 Fusion Card Challenge: Cactus Door -inspired by the colors and plant in the photo. CAS Watercolour Card Challenge: July Splash Watercoloring. Used splash on background and watercolor on my image. 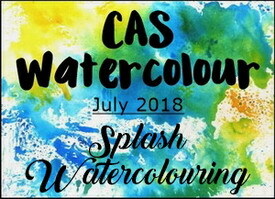 CAS on Friday: Challenge 136 Splash-Watercolor. Used splash on background and watercolor on my image. CAS-ual Fridays: CFC 203 Heat Embossing. Image was heat embossed. 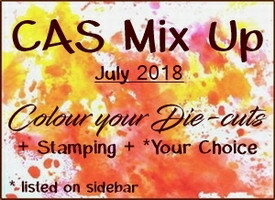 CAS Mix Up Card Challenge:July Challenge Colour your die cut +stamping+your choice. Die cut was water colored. Your splashed watercolored background is perfect with your sweet cactus, Theresa! Thanks so much for playing along with us at Fusion! Such a pretty watercolored background and love the embossed cactus image! Such a pretty card and thanks so much for playing along at CAS-ual Fridays! Your splashed background is so fun and perfect with your sweet pot of cacti, Therese!! Thanks for sharing with us at CAS Watercolour. Your card could be entered at CAS Mix Up as well as the challenge this month is Colouring your Die-cuts. What a cool background! I love that cacti stamp! Thanks for sharing with us at CAS-ual Fridays! 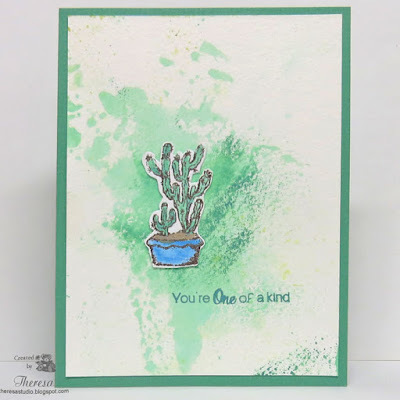 I love the splashed background and your watercolor cactus, Theresa! Beautiful mix of greens! Thanks so much for sharing with us at CAS Mix Up and CAS Watercolour! What a lovely CAS card, loved how you thought of making a card combining different elements together. Must have taken more time to think than to make a card. Thank you for joining us at CAS-ual Fridays heat embossing game. Hugs ~ Ishani. This is such a great card! The colors you chose for your background in addition to your cactus stamp really match well!